Last week we took off in the NSV on Tuesday headed for the campsite we scouted in the Kaibab Forest on our recent recon trip. We had little trouble navigating to the GPS coordinates we had recorded. But, to our chagrin, the site was occupied! We weren't entirely surprised as it is a good spot and certainly not disappointed as we knew there were other sites in the area. It didn't take long to find a great spot in the pines and set up camp. How nice to be hearing the wind in the pines and well, nothing else. At an elevation 7,100 ft. the temperature was forecast to be highs in the 70s and a low of about 50 - just right. Joni catches me asleep; easy to do in a peaceful forest. After a relaxing afternoon and a little exploring around our site we grilled an awesome dinner capped off with a few homemade cookies. Teriyaki Chicken and Potato Pouches served with fresh cherries and a cold beverage. Yum! As the sun set and an evening chill came on we retired to the camper to continue reading and soon retired to bed. Wednesday came as another lovely day and after a leisurely breakfast followed by coffee we were off on a walkabout to the west and north of our camp. We found wildflowers and later a small pond. In the afternoon we took off walking on a small, more remote forest road near camp which we followed until it intersected with a larger road. Along the way we passed through thick, dark areas of forest, so cool and peaceful, along with more open areas with massive ponderosa pines. We're sure there's a proper scientific explanation but a rock in a hole in a rock was a mystery to us..
We also passed mudholes still a little damp from the last rain. Of course these are prime areas to look for wildlife tracks. We saw deer and/or elk tracks, coyote tracks and our first black bear tracks! It seemed to be a small bear but none the less cool to see. 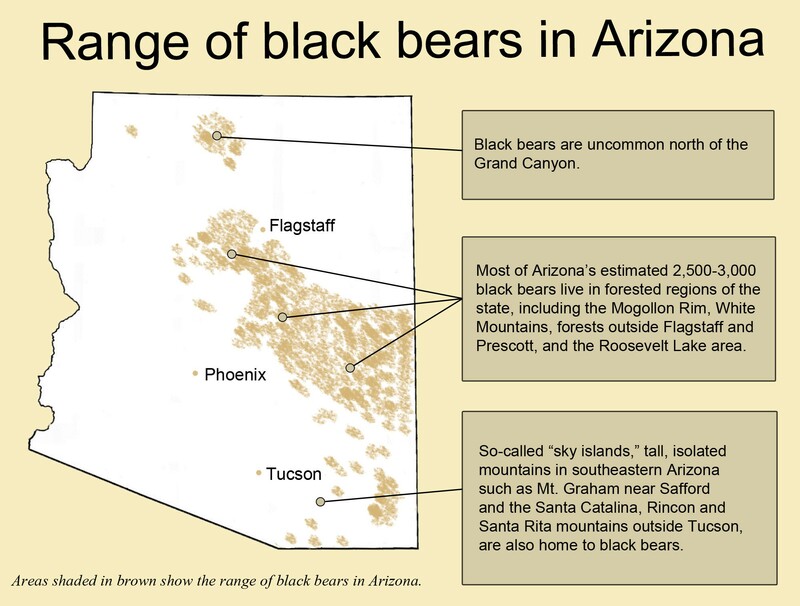 It's estimated there are 2,500 to 3,000 black bears in the mountainous areas of Arizona. Yep, for real, a bear track! Returning to camp we enjoyed another lovely evening. Thursday morning we slept in a bit. We had appointments Friday afternoon and over breakfast and coffee we decided to head home rather than stay another night and be pressured to get back on Friday morning. But with plenty of time left after breaking camp we could certainly explore before heading home. Dirt road through the forest with mountains and clouds in the distance. We decided to follow FR 109 to White Horse Lake Campground. We prefer boondocking (also called dry camping or dispersed camping) but there's no harm in knowing about available campgrounds. Our big surprise was discovering a trailhead on FR 109 for the Sycamore Rim Loop. We stopped at the trailhead, reviewed the map. This trail is a must do on a future trip. We decided our exploration was complete for the day and followed the back roads home arriving in town in plenty of time to wash the NSV and stop at Aroma, our local pizzeria for dinner. Below is a photo of the camp art Joni assembled and Norman the Nomad a totem I carved for Joni (I will readily admit I'm hardly a "master wood carver"). We left the camp art for others to enjoy but watch for Norman in future adventures. Norman the Nomad nestled into the camp art.